Archetype is a thick hardcover art book that doesn't disappoint, all 312 pages of it. This is the second collection of his artwork, the first art book was called Maximum Black (amazon.com). Desperado has done a terrific job publishing the book. It's well bind, with the art brilliantly reproduced on low gloss high quality art paper. 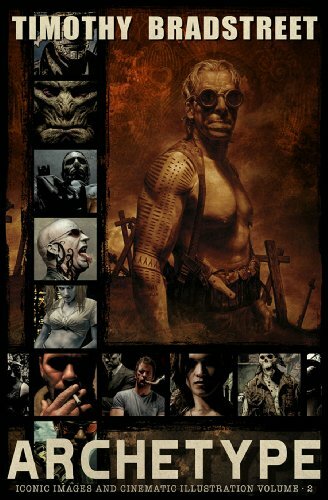 The book collects over two decades of work, from Shadowrun, Vampire: The Masquerade, The Punisher, Hellblazer, Criminal Macabre, rejected illustrations, freelance commissions to unpublished personal projects like "Red Sky Diary". There are just too many to name. Each piece is captioned by Tim Bradstreet himself talking about the background. That's plenty of good read in addition to his illustrating career which is included right at the start. The technical drawing ability showcased is amazing. His portfolio is impressive. The photo-realistic portraits, subtle lighting, and fine use of black just makes every illustration screaming for attention. For me, it's mostly the photo-realistic figure drawings that really blew my mind. I'm sure he used reference, for the book also included several reference photos. But some (a few of my friends actually) might take issue with this method of creating art, which traces over and applies their own style. If you can accept this kind of art creation, then this art book is well worth the money and I highly recommend it. you do know that he "copies"
you do know that he "copies" his reference photos exactly, right? i think there is no "command of figure drawing and anatomy". he shoots a photo and then proceeds to copy it, adding props and stuff here and there. and i was REALLY disappointed when i flipped through his book-> it is so obvious: you can kinda still see the photo reference underneath the actual illustration. My friend and I have always been wondering about whether he traces or not. Some of the illustrations does look pretty stylized, while some photo-real (which I guess are the ones done with reference). Personally I don't really have much problem with tracing as long as the artist puts in significant amount of his own style. Makoto Shinkai, a Japanese artist, also uses references and paints over them directly. It's so good to the point that I go,"So what if he uses references?". His art book is called 新海誠美術作品集 空の記憶 ~ The sky of the longing for memories ~. And there's also the insanely detailed background paintings for Tekkon Kinkreet. I don't know if they are traced over and painted, but that doesn't stop me from going "Wow" either. yeah, i know what you mean and i really do respect his dedication to this technique. he managed to carve out his own niche. it became his very own style. that´s cool and all. i just don´t think he is the great draftsman you make him seem like in your review. Yup, you're right. I've updated my review to reflect that. Thanks for the comment, I won't have known for sure otherwise. There's a feature on the Punisher blu ray that describes in detail how Tim Bradstreet goes about creating a piece. He's a tracer. Takes a photo, gets the tracing paper and traces. Even he seemed a little embarassed when describing his technique. Got familiar with his work mostly through Hellblazer covers and this book looks like a must-have. The reviews on this blog are great, i already purchased the Paul Bonner book some days ago, so.. keep up the good work man. One thing thou, can you try to flip the books more slowly, or maybe just slow down the playback rate on the videos?